There are a number of composers who are best known almost exclusively for writing one particular work from a substantial compositional output. The principal names that spring to mind are Gustav Holst for The Planets; Max Bruch for his First Violin Concerto and Carl Orff for Carmina Burana. Falling into this category is the German late-Romantic composer Engelbert Humperdinck who is really only known for his much loved opera Hänsel und Gretel composed in 1891/92. Based on the Brothers Grimm fairytale the composer described his score as a Märchenoper (Fairytale opera- based on Brothers Grimm). The richly scored opera has become inextricably associated with children and families, and is traditionally performed at Christmas time. Humperdinck wrote a considerable number of works in several genres including a number of stage works but none have come anywhere close to attaining the popularity of Hänsel und Gretel. I am told that the Königskinder (The King’s Children) is sometimes staged but I have never come across it. Contained on this CPO release are six chamber scores the majority of which were composed in the 1870s and only published in recent years with the exception being the String quartet in C major from 1919/20. The earliest work on the release is the single movement Menuet in E flat major for Piano Quintet marked Allegro composed in 1872 as an alternative for a Christmas programme. Bearing a dedication to Johannes Degen, a judge and amateur violinist, the substantial String Quartet Movement in E minor was written in 1873. With regard to completing the score Humperdinck got as far as sketching out another two movements. Cast in three movements, the Piano Quintet in G major was completed in 1875. It seems that it was played by Johannes Degen music group in which Humperdinck would sometimes stand in as the pianist. The score of the central Adagio bears an inscription to the memory of Humperdinck’s sister Ernestine who died aged only seventeen. In the concluding Allegro Humperdinck blends a Scherzo with a Rondo. The String Quartet Movement in C minor takes around 7 minutes. Humperdinck won the Frankfurt Mozart prize with the C minor score. The Notturno for Violin and String Quartet in G major is marked Andante tranquillo. After its completion in October 1879 Humperdinck before the ink was almost dry prepared an alternative arrangement of the score for violin and piano doing away the quartet. Cast in three movements the String Quartet in C major was written some thirty years after Hänsel und Gretel and is Humperdinck’s final chamber score. Humperdinck explained that the central Gemächlich (Leisurely) is a contrasting combination of a slow movement and Scherzo. Irrespective of the tempi indications Humperdinck’s undemanding writing tends to inhabit a similar mood. The prevailing character of the slow movements is one of agreeable geniality: benign, highly attractive melodically with gloriously yearning themes. The outer movements, although occasionally squally and moderately windswept, offer more of the same but with a quicker speed. There’s no whiff of German Sturm und Drang or late-Romantic Wagnerian or Straussian excess in any of Humperdinck’s chamber scores. Owing to the lack of stylistic, melodic and dynamic contrast one can understand why these scores have remained neglected for so long. 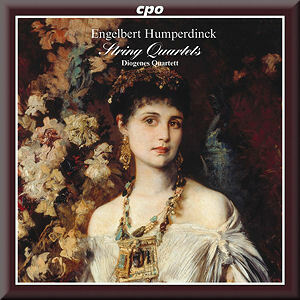 Out of the six Humperdinck works the String Quartet (1919/20) with its catchy central movement Gemächlich is certainly agreeable as is the Notturno for violin and string quartet but it is the Piano Quintet that I consider to be the finest. Without plumbing great emotional depths I also greatly enjoyed the central Adagio of the Piano Quintet for its tender yearning quality; serving as a fine tribute to Humperdinck’s deceased sister Ernestine. The Diogenes Quartet is a Munich based ensemble and was founded in 1996. The Diogenes number the Amadeus and La Salle quartets amongst their teachers. I couldn’t fault the beautiful playing of the Diogenes who adopts a straightforward unadorned style that feels wholly convincing. Glorious string tone and impeccable ensemble are trademarks of this first-rate quartet. For the Piano quintet in G major and the Menuet for piano quintet the Diogenes are augmented by pianist Andreas Kirpal who makes a terrific contribution sharing this music with tightly matched teamwork. The Notturno for violin and string quartet in G major is a real find with the Diogenes joined by Lydia Dubrovskaya who takes the solo violin part. With assurance and refined musicianship Dubrovskaya plays this nocturne quite beautifully. I can easily imagine this score becoming quite a hit on a Classic FM Relaxing Classics programme. The recording was made at the August Everding Saal, Grünwald on the outskirts of Munich and the sound quality is spectacular. It’s vividly clear and superbly balanced too which is something that I rarely encounter where piano and string quartets are concerned.